SAJIDAH WRITES: Mind Your Words, Muslimah. Well, just wanna share my 2 cents about the tweet in the above picture. I have been living on this Earth for 26 years and I can say that majority of the women that I know are hijabis or women with hijab. And so far, I can say that we do have different kind of characteristics and no, simply putting a piece (or maybe 2 pieces) of cloth on our heads is not a guarantee that we have a good akhlak. When I say akhlak, it includes the manner of talking, mingling with others, as well as the manner while writing. In today's world where social networking becomes an important part of our days and nights, it is significant to relate the issue of writing since we are connecting with others (in social network or instant messaging) mostly by typing words. 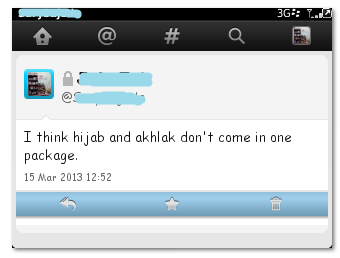 I can say that it is a normal phenomenon for us to see hijabis using harsh words or cursing whenever they are online. It is so sad actually to say that this kind of situation is now considered as 'normal'. I understand people can't escape themselves from having the feeling of hating something or someone, but we have the choice whether or not we want to display that hatred. If you have Twitter account, I think you know exactly what I mean and always witness it on your TL. Hopefully you are not one of the people who keep cursing in their tweets. Yes you have the freedom to say anything, but you are accountable for it. Plus, I think when you are displaying your bad words publicly, you lose their respects. You gave them negative impression about yourself. And about Islam. Remember one simple rule from our Prophet sollallahu 'alaihi wasallam? I have a few non hijabis friends as well. 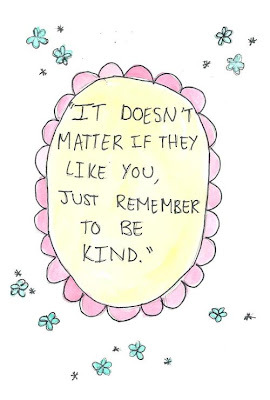 However, you know something? It really attracts me when I see that they are very kind, and what I like the most about them is they always, always use kind words such as Bismillah, Alhamdulillah, insha Allah, Astaghfirullah etc. It really melts my heart to see them having those words closely to their mouths and hands (read: speeches and writings). Yup, not wearing a hijab is wrong, but cursing is wrong too. And hurting other people's hearts with your harsh words is definitely wrong as well. I am not making a generalization about hijabis and non hijabis, instead I wanna share my thought about the tweet in that picture I attached. All of us, Muslim women, both hijabis and non hijabis still have to strive to do as much deeds as we could and leave the wrong doings far, far behind. I don't have twitter so I don't know how to comment on that. In someway i think what ur friend said is true. not all tapi ada la memang jadikan twitter tempat lepas geram maki hamun semua. kalau tgk isu berita artis gaduh sume pun biasanya kat twitter kan.
inshaAllah we'll try our best not to curse or display our hatred publicly. May He purify our hearts from dirt we can't see.